Gozi ISFB is an eBanking Trojan we already know for quite some time. Just recently, a new wave was launched against financial institutions in Switzerland. Similar to the attack we had already reported in September 2015, Cybercriminals once again compromised a major advertising network in Switzerland daily visited by a large number of Swiss internet users; they all become potential victims of the Gozi eBanking Trojan. One of the commonly known features of Gozi is its Domain Generation Algorithm (DGA). 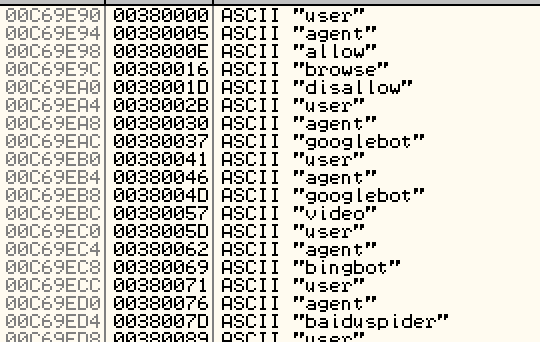 DGAs produce a set of more or less harmless looking domain names that the bot tries to connect to as their command and control server (botnet C&C). Gozi usually takes the current time as input parameter, and sometimes includes commonly accessible Internet resources (URLs) that need to remain unchanged over time. This gives the Trojan more stability and resilience against take-down operations conducted by Law Enforcement or Security Researchers. In addition, the use of additional Internet resources helps against internet-less sandbox analyses. The Gozi DGA is no big secret and has been known for quite some time. The first Gozi variants used the American Declaration of Independence as its source, which is stored on http://constitution.org/usdeclar.txt. Naturally, the Declaration of Independece is not very likely to change, so the Gozi gang could be sure to have a stable input for their algorithm. Occasionally, some Gozi campaigns use different Internet resources (URLs) as source. robots.txt files of different webpages appear to be quite popular, because their contents usually never change. This was also the case in the recent Gozi campaign that hit Switzerland. As the DGA is known, we just fed the content of this new robots.txt into a Python script to calculate the domains... and were surprised to see that the generated domain names differed from what we saw in our lab bot. Now, of course we could just let the lab bot generate the domain names and use them, but it’s a time consuming process, and we still wanted to know what went wrong - human beings are curious ones after all. Hey Gozi guys, you have a bug in your Trojan! if len(words)>0: words += " "
It is not very elegant, but simple. What can go wrong here? We verified if the minimum length of words was changed, but this wasn’t the case. The code was the same as in all the old Gozi samples we had analyzed. After quite some time we found the problem... While our script worked as intended, the Gozi code had a buffer overflow bug. Buffer overflows are one of the major cause for vulnerabilities and offer malware the opportunity to infect computers. In this case the buffer overflow appears ironically in the DGA of a malware. No problem so far. But now the code wants to concatenate all these words placing space characters in between. Usually you would allocate a new data block to receive the final string, but the programmers tried to save some memory and thought - correctly - that this step won’t make the data in the source block longer, but most probably even shorter (in the worst case the size will not change). So they decided to write back into the same data buffer. This will result in a few overlapping strcpy operations, at least at the start, but due to the order of how strcpy copies the character - from first to last - this won’t result in problems. This is actually correct... the strcpy operations will all work - ugly, but not buggy. But the problem occurs in the following strcat, the call that appends a space after each word. This is a strcpy of the first "user" word to itself. You see that both, source and destination addresses are identical (00380000). This definitely is an overlapping strcpy. This is not yet the problem. Actually the data won’t change at all. "agent" is gone. The only relict is a double space after "user". And indeed, after we removed "agent" from our wordlist, the Python script produced the correct domain names.
" Declaration of Independence ..."
"# Officer Barbrady says "Nothing to see here...."
Here we have only 2 leading characters, a hash and a space, but that suffices. The first strcpy of "officer" will be self-overlapping, but nothing bad happens here. A space can be appended safely too, and while the following words are also self-overlapping, there is always at least 2 characters left to use. The problem can only occur when a text immediately starts with a word, and the next words follow with exactly one non-letter in between. Then this second word will "magically disappear". Interestingly only the second word can be affected, even if all words would only be one-character words. This observation is (most probably) an unintended buffer overflow that makes the DGA a bit more secure and one of the only buffer overflow that can improve the security of a program.